Editorial Board for Volume 3. Contributors. Preface. Fungal genomics: An overview (A.E. Desjardins, D. Bhatnagar). Meiotic recombination in fungi: mechanisms and controls of crossing-over and gene conversion (B. Lamb). Molecular genetics of circadian rhythms in neurospora crasa (A. Correa, A.V. Greene et al.). Genome sequencing, assembly and gene prediction in fungi (B. Loftus). Fungal transposable elements: inducers of mutations and molecular tools (F. Kempken). Fungal mitochondrial genomes, plasmids and introns (G. Hausner). Evolution of the fungi and mitochondrial genomes (C.E. Bullerwell, J. Leigh et al.). Ribosome biogenesis in yeast: RNA processing and quality control (R.N. Nazar). Fungal pathogenicity genes (P. Tudzynski, A. Sharon). Genetic improvement of baker's yeasts (P.V. Attfield, P.J.L. Bell). Enzyme production in industrial fungi: molecular genetic strategies for integrated strain improvement (K.M.H. Nevalainen, V.S. Te'o). Global expression profiling of the lignin degrading fungus Ceriporiopsis subvermispora for the discovery of novel enzymes (D.S. Yaver, B. Weber, J. Murrell). Microarrays: technologies and applications (Leming Shi, Weiming Hu et al.). 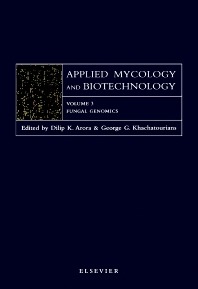 Fungal germplasm and databases (K. McCluskey). Key-word index.